Our Magpie of the Month, Queen Mathilde of the Belgians, has an impressive collection of earrings, but few pairs have remained favorites as long as today's earrings, her Diamond Scroll Earrings. The diamond earrings have been in Mathilde's jewelry box for about fifteen years. They were reportedly purchased for her by her husband, King Philippe, from the Belgian jewelry firm Leysen. 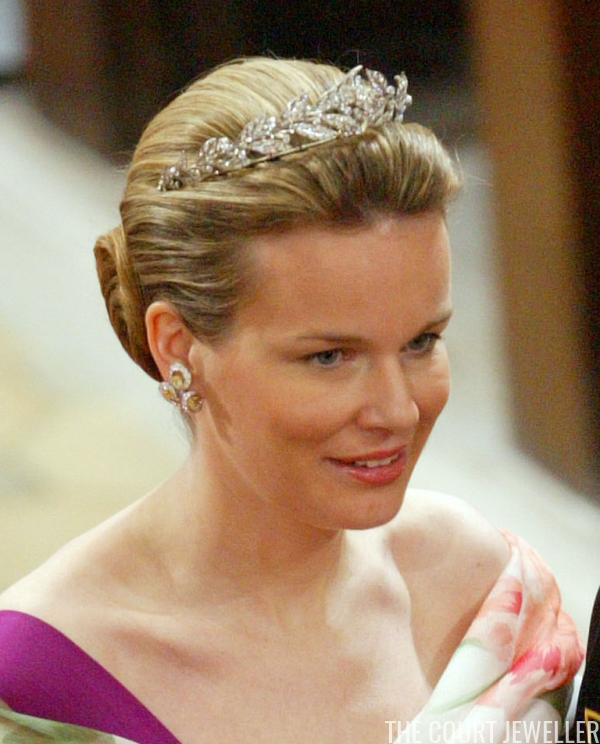 Mathilde began wearing the earrings in 2003, and one of her early important appearances in the pair came at the Danish royal wedding in 2004. The earrings feature a trio of white diamond scrolls, each with a yellow diamond set in its center. I've seen some remark that the earrings resemble the letter "E" -- I'm not sure if that's intentional, but if it is, the earrings might have been a gift following the birth of their eldest child, Princess Elisabeth, who is now the Duchess of Brabant. I've also seen speculation that the yellow diamonds in the earrings can be swapped out for other stones. This appears to hinge on a single appearance in Shanghai in November 2004, when Mathilde wore the earrings for a gala dinner with a dark green gown. In some photos from the event, the larger stones in the earrings do appear to be darker, but I'm not convinced that it isn't just a trick of the light. If the earrings were convertible, I imagine we might have seen Mathilde experiment with them a bit more. 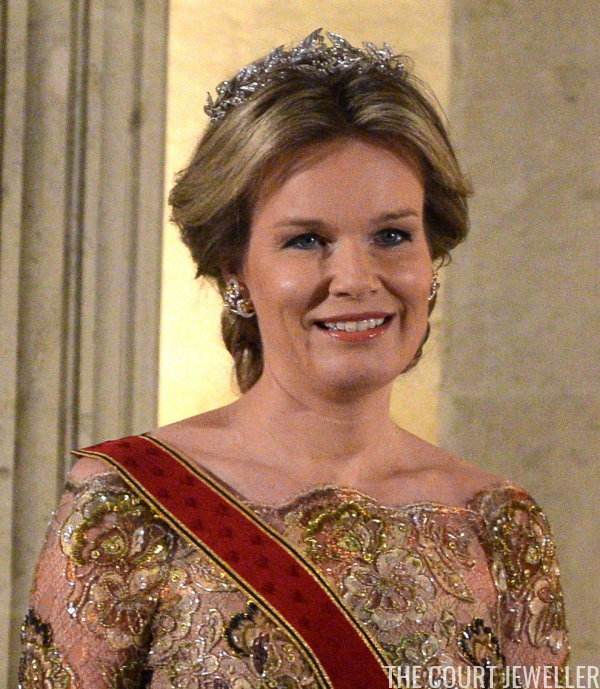 Mathilde has mainly used the earrings for glittering gala occasions, both with and without tiaras. They're not huge, but the earrings pack enough sparkle that they easily work as spotlight accessories with an outfit. They also coordinate well with Mathilde's tiaras. Above, she wears the earrings with her laurel wreath tiara during the German state visit in March 2016. 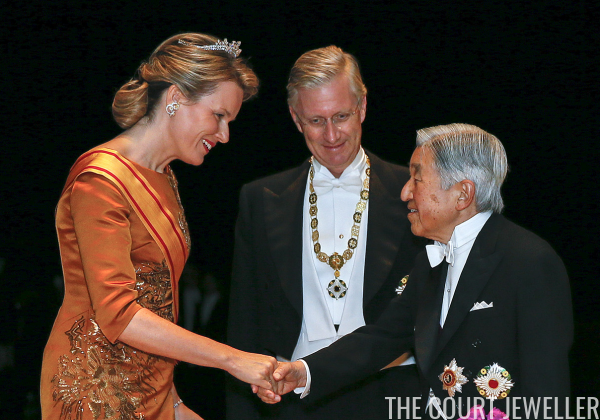 And here, she pairs the earrings with the Wolfers Tiara in Japan in October 2016. Although Mathilde primarily reserves the earrings for evening events, she's also occasionally worn them for important daytime occasions. Here, she pairs them with Queen Fabiola's Diamond Fringe Brooch at the wedding of her husband's cousin, Hereditary Grand Duke Guillaume of Luxembourg, in October 2012.